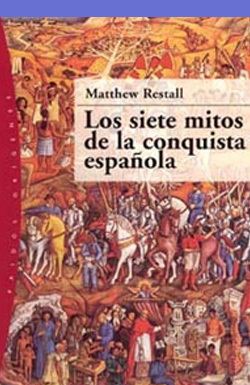 Matthew Restall: Los siete mitos de la conquista española. Barcelona: Paidós, 2004, 308 pages. Translated by Marta Pino Moreno. ISBN: 978-84-493-1638-8. Spanish translation of the original title: Matthew Restall. Seven Myths of the Spanish Conquest. Oxford and New York: Oxford University Press, 2003. Published in Spanish by Paidós.